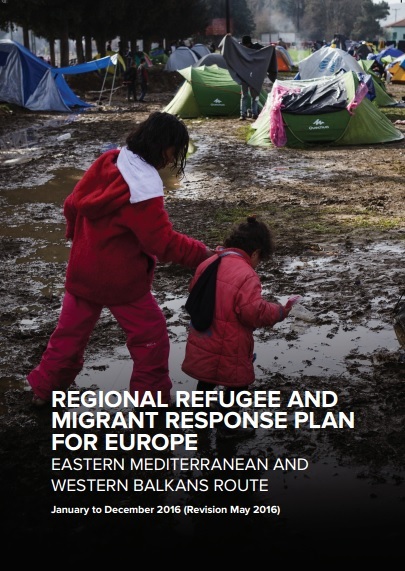 The regional Refugee and Migrant Response Plan (RMRP), involving 60 partners, was launched in January 2016 following the large-scale population movements registered throughout Europe in 2015, when one million refugees and migrants undertook the perilous journey across the Mediterranean Sea. The vast majority crossed the Aegean Sea by boat from Turkey to Greece. Many lost their lives: in total, 3,771 people died or were reported missing in the Mediterranean Sea in 2015. Despite worsening weather conditions brought on by the onset of winter, the movements did not subside during the first quarter of 2016, with some 171,132 arrivals by sea from January to March 2016, including 151,452 to Greece in the same period. To date, 156,782 people have arrived in Greece, and 2,814 have been reported dead or missing in 2016. The vast majority of these people are in search of safety and protection; 90 per cent of those arriving to Greece come from the world’s top 10 refugee-producing countries, primarily from the Syrian Arab Republic (Syria), Afghanistan and Iraq. Throughout this crisis, refugees and migrants arriving in Europe have not intended to stay in Greece, the first country of arrival for long, but instead aim to continue their journey onwards. The Western Balkans route became an important transit axis, with thousands of people travelling through Greece, the former Yugoslav Republic of Macedonia, Serbia, Croatia and Slovenia before reaching their final destination in Europe. The transient nature of the population movement required humanitarian partners to develop a flexible and pragmatic response to ensure the most effective and protection-centred approach. From a light operational footprint, humanitarian partners managed to quickly deploy staff and resources to ensure a 24/7 presence at border crossing points. In Greece, the initial response focused on the islands in the Aegean Sea, where, in early 2016, up to 2,000 people in need of immediate assistance and protection arrived on a daily basis. Along the Western Balkans route, efforts were devoted to ensuring access to adequate and safe accommodation, as well as protection-centred assistance. Circumstances started to change drastically as of mid-February 2016 with the progressive establishment of border restrictions between the former Yugoslav Republic of Macedonia and Greece, followed by further restrictions along the Western Balkans route, leading to an effective closure of the route on 8 March 2016 for non-EU citizens without requisite documentation. On 18 March, the EU and Turkey agreed on measures to halt the movement of refugees and migrants traveling from Turkey to the EU (henceforth the EU-Turkey statement). In essence, the agreement aims to address the flow of refugees and migrants crossing the Aegean from Turkey to the Greek islands irregularly after 20 March 2016. These developments have had a significant impact on the numbers of refugees and migrants arriving, with a decrease in the number of people along the Western Balkans route and an increase in the number of people remaining in Greece, in particular on the mainland. While the measures adopted in March have significantly reduced the number of daily arrivals (from an average of 2,200 arrivals in mid-February 2016 to an average of 120 in late April 2016) in Greece, nearly 54,000 refugees and migrants are currently dispersed across Greece in sites on the mainland and the islands. Unmet needs remain significant, as living conditions in the sites in Greece, both on the islands and the mainland, have deteriorated as a result of congestion and the rapid nature in which sites were established on the mainland. The affected population include many people with specific needs, such as unaccompanied or separated children (UASC), single women, pregnant or lactating women, the elderly, people with disabilities, as well as the sick and injured. The number of children in these movements has been on the rise, reaching 38 per cent of the total arrivals from Turkey to Greece in 2016. In this context, humanitarian partners have redefined their engagement from a response primarily targeting people on the move to focusing on a static population in Greece and on protection activities in countries in the Western Balkans, recognizing, however, that a limited number of people will continue to move onward, but in a clandestine manner. There is a risk that these people will increasingly rely on smuggling and trafficking networks, exposing themselves to greater protection risks, which will be even more challenging to address considering the clandestine nature of the movement. The present revised RMRP outlines this shift in priorities, as well as operational and financial readjustments. It presents a framework that will enable the humanitarian community to adequately respond to the protection needs of refugees and migrants. The main strategic goals as outlined in the RMRP in January 2016 are maintained in this revision of the document. Emphasis is placed on: ensuring consistent border and protection monitoring, especially in light of the increase in clandestine movements; strengthening existing national protection and response mechanisms; and promoting access to fair and efficient status determination procedures, relevant services and assistance.